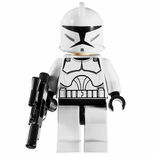 A Clone Trooper is a minifigure based on one of the many soldiers of the same name from the Star Wars universe. Clone Troopers have appeared in many different variations and have been playable characters in all of the LEGO Star Wars video games. 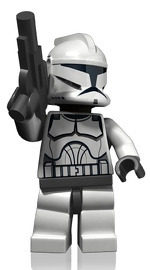 The first Clone Trooper minifigures appeared in 2002 as part of the the Attack of the Clones subtheme, and is based on a Clone Trooper in Phase I armour. This minifigure feature plain white legs with a black leg joint, and a white torso with black hands. The torso piece has printing on both the front and the back. On the front, plates of armour, including chest plates are outlined in grey, as well as a belt towards the bottom of the piece. Black printing is used for two horizontal stripes on the right chest plate, and around where the middle of the torso connects to the arms and a head piece, representing the clone trooper's black bodysuit worn underneath the armour plating. This black bodysuit printing is also present on the back, as is grey printing for the backplate, the continuation of the belt, and a thermal detonator. The helmet of the first Clone Trooper variant is white, with a large crest in the centre of the top of the piece, and a T-shaped hole in the front, so that when fitted on to a headpiece, whatever is on the headpiece will show through. The helmet has printing above the hole- a black line above the hole, small grey areas above the end of each side of the black line, and black printing below helmet's hole for the mouth area. A black rectangle is also placed just underneath this mouth area. The Clone Trooper's head piece is plain black, so that when the helmet is placed on the head, the hole in the helmet is filled, and a black T-shaped visor is represented. 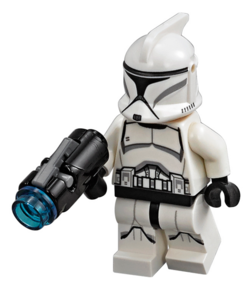 This variant of Clone Trooper was armed with a blaster made out of a black piece predominantly used in the City theme as a megaphone, with a stud placed on the end. In the set 7163 Republic Gunship, the studs are a transparent orange, whereas in the set 4482 AT-TE (released in 2003), the studs were transparent blue. The second variant of Clone Trooper was one based on Phase II Clone Trooper armour. This minifigure retained the first's legs, torso and head, except the printing on the torso was changed from grey to a new grey that was introduced in 2004. The major change between this trooper and the first variant was the helmet- a newly moulded piece was made for this helmet, featuring a smaller crest than the first. It also included the depiction of breathing filters, and curved sections in the T-shaped hole around the place each eye would be. The helmet again features printing, retaining a horizontal black stripe and grey areas, and a mouth area but one which was reduced in size. Black lines are also present on the sides of the breathing filters, and three black circles at the front of the filters. In 2005 and 2006, the Clone Troopers were armed again with blasters again made out of black megaphone pieces and transparent blue studs, however in 2007, new specially moulded blaster pieces were introduced. In the 7655 Clone Troopers Battle Pack, two standard Clone Troopers were included, both with a black blasters, one of which also had grey electrobinoculars. A computer-generated Clone Trooper from LEGO.com. Clone troopers were grown and trained on Kamino, cloned from the bounty hunter Jango Fett for the Galactic Republic. The troopers were first called into service during the Battle of Geonosis, when Obi-Wan Kenobi, Anakin Skywalker and Padmé Amidala were captured. A Jedi taskforce led by Mace Windu was initially sent in to rescue the three captives, however the large number of Battle Droids eventually wore down the small army. Clone troopers flew in on LAAT/i gunships with Jedi Master Yoda, evacuating the surviving Jedi. The Grand Army of the Republic, led by Jedi Generals then managed to overcome the Confederacy droid forces on Geonosis, and the first battle of the Clone Wars was won by the clone and Jedi forces. Clone troopers continued to serve as the main infantry units throughout the Clone Wars, participating in most battles throughout the galaxy-wide war. While most clones were standard infantry, some took on specilist roles, such as pilots, gunners, and bomb diffusers, however all had some degree of proficiency with handheld blaster weapons. Clone trooper armour evolved over the course of the three-year war, first beginning with the Phase I armour, and transitioning into Phase II, which was more confortable for the troopers to wear and offered greater protection. As the Clone Wars drew to a close, Chancellor Palpatine, who was secretly the Sith Lord Darth Sidious and enemy to the Jedi, ordered the clone troopers to execute Order 66, designating the Jedi as traitors to the Republic who should be shot on sight. The vast majority of clones complied, killing their former Generals and crippling the Jedi Order. After Palpatine reformed the Republic into the Galactic Empire and declared himself Emperor, he ordered his apprentice, Darth Vader, formerly the Jedi Knight Anakin Skywalker to eliminate the Separatist leaders who he knew were stationed on the planet Mustafar. After Vader completed this task, he then broadcast a signal he obtained from the Separatist base, which shut down the droid forces, effectively ending the Clone Wars. Under the rule of the Empire, clone troopers transitioned into the soldiers known as Imperial Stormtroopers, a force made up of clone troopers initially, but later also consisted of male humans who were either uncloned or cloned from sources other than Jango Fett. All good clones must come to an end. Clone troopers are excellent diplomats. Do clone troopers dream of electric mynocks? Spinning isn't always a good trick...or is it? This page was last edited on 9 April 2018, at 23:56.